It has been placed on my heart to write a series about how we can each be a better help meet to our husbands. You can be assured that as I felt God urging me to write it…I tried very hard to argue with Him (which we all know is always so very effective). Don’t I need to be some super-wife to write a series like that? Don’t I need to wait until my husband and I have been married for like 147 years or so before I write something like that? Don’t I need to have a special degree in marriage and family and blissful marital bondedness? Don’t I need to wait until I’ve learned to always be gracious and sweet and loving and patient and I don’t know…nearly perfect…to write a series like that? And what about that one very specific thing that God created only for married people to do? You know what I’m talking about? Mmhmm…that. I’ve never mentioned that on my blog. How am I supposed to talk about that? If I do this series, I’ll have to address that a time or two since that is a pretty important part of marriage and being a help meet. Laura – Zero, start typing. God – One, but don’t worry I’ll help you. And so, it is with much prayer and humility that I begin this series. I know that not all of you are married yet. I know that some of you are divorced or widowed. I know that some of you are in difficult marriages. I know that some of you might disagree with part of what I share. Please understand that I’m writing what God has put on my heart. I’m writing only from my experiences. I’m writing without any training or degree in this area. I’m writing based on what I’ve read in God’s Word. I’m writing as one dishpan-handed wife to another. I’m writing because our marriages are sacred and holy. Our marriages deserve to be preserved, honored, rescued and treasured. 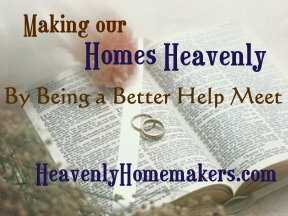 What better way to Make our Homes Heavenly than through our marriages! Fortunately, God has also blessed you with a sense of humor and a dose of realism that will make this series VERY helpful! This is great! I have been married for 10 years, and we do pretty good, but marriage is important in the church, it is an example of God’s love for the church, so it is important that we are deliberate in this area. And at the risk of using an over used business phrase, it is important that we are seeking “continual improvement”, that we never get stagnant or settle for good enough. I’m SO looking forward to your series! May God’s words be used through this blog! Thank you, thank you. I am needing this! Really looking forward to this! I’ve been struggling with being a good wife to my husband lately. I can use all the help God sends my way! I can hardly wait!!! And since you have such a way of putting things, like punctuations :), it will be interesting to see how you name THAT topic! I think we can all use this series. Thank you for being so humble and obedient to God. I want to be a better wife and I can use what God has placed on your heart to share with us. Praying for you, Laura! This is one thing I love about blogging. We can all learn so much from each other. No one has to be an expert, just real. Glad you are following your heart and what the Lord has placed on it! I am thrilled that you will doing a series on this topic. This subject has been heavy on my heart lately. I am eager to learn more and am excited that you will be doing a series on it! Laura, you are always so refreshingly honest in everything you write, and you seem to have a wonderful relationship with your husband. I can’t wait to hear your tips & tricks, and also would love to know if there are ever “sour spots” in your marriage…any bumps in the road…and how you deal with them. Anyway, thank you in advance for introducing this series!!! Oh I hope not, I don’t agree w/most of what the Pearl’s say. They seem to twist the Word of God. Most Christians I know found the book highly offensive. Well I’m not Baptist… Baptists believe stuff that I don’t, and vice versa. So it’s all good. But I take her book w/a grain of salt. Not every book is for the good of all things, and I certainly don’t need her “ideas” of being a better wife, or being submissive. I am thankful that you are willing to undertake, w/God’s guidance, such a daunting task. As Christian women we so often want to give the impression that God has zapped us and our lives, marriages and families are now perfect. That isn’t the case for anyone I know but He has given us a thorough instruction manual to follow. I look forward to looking in God’s Word w/you for this series. You will be great! God will use you. Just stay strong and He will give you the words! I am sure this will be great and I can’t wait! I am really excited about this series! I will be praying for you as the Lord brings you to mind. Be courageous! Be not afraid. The Lord will fight for you! :) May the Lord bless your obedience to Him and may He cover any backlash that will come. Stand strong and write on! Have you read Created to be His Help Meet by Debi Pearl. A challenge for sure. Can I just say that the term “help meet” makes me laugh every time I hear it? I know it’s not funny, but it is. What a strange term. Can I agree? I think this term is used more heavily in some denominations, and apparently not in mine! When seeing the term on a blog years ago, I mistakenly thought the author had intended to write “help mate” and had been the victim of a typo! I think I will just stick with being a loving, devoted Christian WIFE…but I am looking forward to the series, whatever the title! That’s funny…I never really thought about it sounding weird. It’s a term I’ve heard forever. Help Meet. Just so I never mis-spell it Meat… That would be bad. that in this context it would mean “especially suitable or compatible”. This is why entomology ought to be taught in school! Sorry, I meant ‘entymology’ meaning the study of the history of the English language. Not “entomology” the study of insects, yuck! Laura! I am. so. excited! Tomorrow, my husband and I will celebrate 8yrs. Not so long to some, but we have come so far! We both agree that these last 3yrs have been so much easier than the first 5. Blessings to you, for you are a blessing to each one of us! Must say I am glad God won on this. I am looking forward to learning what you have to say about this. Thanks for having the courage. I think you’ll do a great job! I am looking forward to your perspective on marriage. My hubby and I always tell people it is a job and get very frustrated when they just give up and divorce. Good luck and happy typing! Thank you – I need this right now! Our baby has become my first (and sometimes only) priority, and it is really affecting our marriage. I am looking forward to reading what you and others have to say. I’m looking forward to this! I have been following your blog for a few months, and am so encouraged. Thank you! I’m really looking forward to this. I’ve sat through marriage classes where it’s taught by someone in a totally different season of their lives, and while I appreciate their wisdom, there is nothing like hearing from someone who is in the same season as myself. Can’t wait to see what God shows us through this! You can only be content when you are in God’s will and that means obeying him – you knew that didn’t you?! Of course you did – that’s why you’re doing this series. I am looking forward to it and I will be praying for you, because Satan is going to do everything he can to discourage you and convince you that you shouldn’t do this. I can’t wait to read what the Lord has put on your heart!! looking forward to this series Laura. you’ll do great! Wife of 11.5 years who does not even begin to claim I know anywhere near ANYTHING, let alone all, on this topic! What a blessing!! i was just asking my husband yesterday what i could do this year to be a better wife and helper!! I’m sure God will use you to open the eyes of many women in areas we need improving! and regarding your struggling with this particular blog a little phrase comes to mind…..GOD DOESN’T CALL THE QUALIFIED BUT QUALIFIES THOSE HE’S CALLED!!! No one (not even the ones with degrees and such) are truly able to write anything at about marriage as if they have arrived – for none of us have! May God bless you as you do this series! What a great topic to blog on. All of us could use help to become better helpers for our husbands. None of are perfect and none of our marriages are near perfect. We live in a sinful world so that would never be possible. May we look forward to our heavenly home where everything WILL be perfect. Will you pass on books you have read on the subject perhaps? My husband and I purchased Love and Respect by Emmerson Eggerich. We have been married 9 years and I really am looking forward to studying this book. The love and respect series is fabulous! Good luck with it- you will enjoy it! Nope, you didn’t miss anything. And nope, I’m not doing a study on her book. I did read her book and ended up with very mixed feelings about it. Some parts really helped me realize what my God given role is…others made me feel very inadequate. This series is just from my own heart. I don’t plan to use any resource other than my Bible and my experiences. Oh good! I can’t wait to see your insights. What an exciting series. I look forward to seeing what God places on your heart. Will you talk your husband into doing a post??? If he’s not intimidated to blog to a gaggle of women-folk, I think his expertise as the recipient of your help meetness would be invaluable. I agree (on the husband post)!!! What a fantastic idea! This is wonderful. I can’t wait to hear your thoughts. I pray that God will speak through you to reach many women. Great!! Look forward to all the chat about this. Not married yet, but have been praying a lot lately that God would use this time to prepare me and mold me to be a Godly wife one day (if He desires for me to be married). Can’t wait to see what you have to say! This series will take a lot of courage to write, but I am really looking forward to reading your thoughts. I have been enjoying your site for several months now and I really appreciate all that you have shared here. i can`t wait to read your blog.I have been married for 34 years.I think we can all learn from each other.I want to do the best I can to help my husband.He is truly a gift from God.Thank-you for doing this. Funny, all of my personal goals for 2010 have to do with this subject. I’d like to hear what you have to say as well. Just let God lead you. just “joined” the blog today and WOW! do i feel i was led here for a reason! can’t wait to read your views, opinions, suggestions, experiences, etc.. God is good! Laura, definately do it! We need more women who are willing to follow Titus 2. I am excited to read your new series and pray that your heart would be open to what God has to say. I want to encourage you to keep on keeping on if this is what God has said for you to do. I know from reading many blogs that talk about this kind of thing you will be attacked. I love your blog and will pray that you can be a blessing to many and that you can ignore the few that might try to discourage you. Funny, I have had that same argument with God over a number of things. Somehow following through is always extremely gratifying. I too am also excited to read what is to follow. Thanks for already showing us that you desire to seek after Gods word and obey Him in your life. I’m glad I’m not alone on that! With so many singing her praises, I’m glad I’M not alone on that LOL. I read quite a few books by them … and they all got thrown in the trash. Yeah there were quite a few things that made the hair on the back of my neck stand up. Don’t get me wrong, I’m all for submission–mutual of course. What she teaches? Should be illegal lol. meet is the something that is missing. Praise to God for directing you to this. I am one of those that have been married for a long time and I still struggle every day with being the kind of wife God wants me to be.I am looking so forword to this I just can’t put into words.I will be reading every post so that my struggle may become easier.